Aims and Scope: Environment Conservation Journal aims to publish original research/ review papers/ Book reviews/ Reports on conferences/ seminars/ important events, news of interest/ information on forthcoming seminar/ books on the environment related aspects. It encourages submission of two categories of papers. The first category comprises scientific papers and second category comprises engineering papers. The study of environment is inherently multidisciplinary. Therefore, the Journal publishes wide range of topics including. Authors are requested to download the Consent to Publish and Transfer of Copyright form from the Website. Please send a completed and signed form by mail to the Environment Conservation Journal Office. It supports a wide range of submission file formats, including MS Word, Adobe Pagemaker 5.0, RTF and GIF, JPEG for figures. Pdf is not the recommended format. Manuscripts: Manuscript should be typewritten with double spacing and wide margins on high quality white paper. Subdivision of the paper into Abstract (50-100 words), Introduction, Materials and Method, Results and Discussion, Conclusion, Acknowledgements and References is recommended. In addition, section headings are often useful. Page 2: of the manuscript should contain the Abstract (50-100 words) and at least six keywords in alphabetical order. These are to be cited in the text by the author's name and year of publication like Gautam, 1989 in between the sentence or (Gautam, 1989) at the end of the sentence. Reference should be listed alphabetically in an unnumbered list at the end of the paper in the following pattern. Bhutiani, R. and Khanna, D.R., 2006. Ecological study of river Suswa: Modeling DO and BOD. Environmental monitoring and assessment, 125:183-196. Gautam, Ashutosh (ed.) 1998. Conservation and Management of Aquatic Resources, Daya Publishing House, New Delhi. Bhutiani, R., 2004. Limnological status of river Suswa with reference to its mathematical modeling, Ph.D. Thesis submitted to Gurukul Kangri University, Haridwar, Uttaranchal, India. Goel, P.K. and Autade, V.B., 1995. Ecological studies on the river Panchganga at Kolhapur with emphasis on biological components In. Ashutosh Gautam and N.K. Agarwal (eds. ), Recent Researches in Aquatic Environment, Daya Publishing House, New Delhi. pp: 25-46. Tables should be typed on a separate page bearing a short title and numbered sequentially throughout the text. All photographs, graphs and diagrams should be referred to as a 'Fig.' and they should be numbered consecutively (1, 2, etc.). All illustrations should be submitted separately, in a form suitable for direct reproduction, Illustration should be designed to allow 50 % reduction. These should be numbered sequentially. Captions and legends should be on a separate sheet. Proofs will be sent to the corresponding author by e-mail (if no e-mail address is available or appears to be out of order, proofs will be sent by regular mail). Your response, with or without corrections, should be sent within 72 hours. Always quote the Mss. No. and Journal Code ( ECJ ) along with your proof in the subject field of your email. A reprints order form will accompany the acceptance letter. The purchase of 25 reprints is compulsory and corresponding author will not receive reprints free of cost and Nominal cost will be charged for reprints. Authors will be asked, upon acceptance of manuscript, to transfer copyright of the manuscript to the Society. This will ensure the widest possible dissemination of information under copyright laws. Prof. D.R. Khanna, Editor-in-Chief, Environment Conservation Journal, 405,Vivek Vihar, Ranipur More, Haridwar, 249407, Uttarakhand, India. or to Dr. Ashutosh Gautam, Executive Editor, India Glycols Ltd. Bazpur Road, Kashipur 244713, U.K. India. In case you encounter any difficulties while submitting your manuscript online, please get in touch with the responsible Editorial Assistant by clicking on "CONTACT US" from the toolbar. 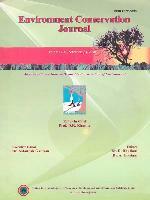 It is a condition of publication that manuscripts submitted for publication in Acceptance of an Article/Paper by The Journal, the Author(S) will be asked to Transfer the Copyright of the Article to the ASEA, that will Environment Conservation Journal have not been published or submitted for publication simultaneously elsewhere.